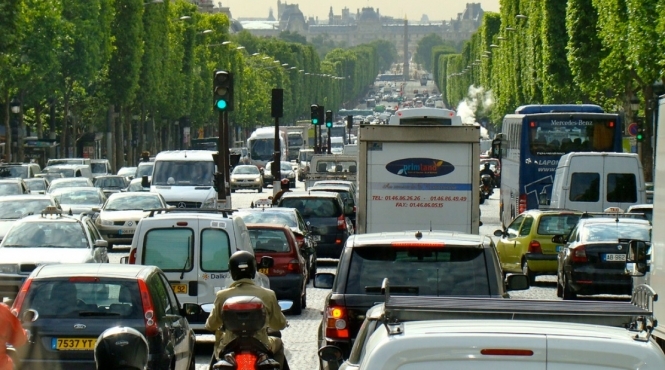 France could soon introduce congestion charges for any vehicles that enter large towns or cities, in a bid to fight excess pollution. François de Rugy, minister for ecological transition, confirmed the proposals this week, and said the scheme would “fight against pollution and damage to the environment”. The so-called “tarif de congestion” would apply to towns and cities with more than 100,000 inhabitants, and limit areas that vehicles could drive in town centres. The perimeter of the area would be clearly marked, and the zone would also likely be in operation during peak hours only. Vehicles that want to enter the zone will have to pay a fee. It will be the reponsibility of the cities’ own circulation authorities, l’Autorité Organisatrice de la Mobilité (AOM), to impose the congestion zone, and it will the AOM that collects the charges. In the Paris region, it would be Ile-de-France Mobilité that would operate the scheme. A “teleservice” phone or online system would be set up to facilitate payment, and advise drivers of the amount they would need to pay in advance, should they enter the zone. Charges would likely be capped at €2.50 per vehicle per zone, and €5 for cities with over 500,000 inhabitants - which would comprise Paris, Marseille, and Lyon - the proposals said. For comparison, the London congestion charge, which was introduced 15 years ago, is currently set at £11.50 (just over €13) per private vehicle per day per entry into the zone, and operates from Monday to Friday. In London, drivers can set up automatic payment, pay in advance online, or pay by phone. Drivers that enter the zone and do not pay in advance will pay more, and those that do not pay at all risk fines. Some vehicles are exempt, for example emergency service vehicles, those used by disabled people, or those certified as ecologically-friendly, such as electric cars. The proposals have suggested a similar system in France, and also said that “people whose home or workplace is within the zone” could also be offered exemptions. Similarly, the “environment performance of the mode of transport” could also be taken into account.